Electro Kinetic Technologies recently completed a custom project for major Fortune 50 food products manufacturer that began in September of 2014. 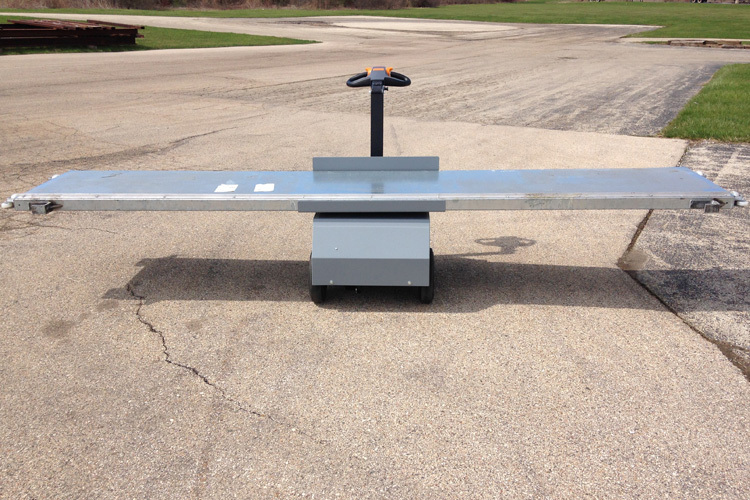 Within the client’s Texas-based manufacturing process, steel pallets that are 12’ long and 3’ wide are essential. These pallets are connected together up to 37 in total that form a conveyor system for the final product. Each pallet weighs 220 pounds. Over time, these pallets are in need of repair and must be removed for repair. Workers must pull the string of 37 pallets (8,000 pounds total weight), lifting the first pallet off and move it out of the building. Once repaired, they are moved back into the building, and loaded back onto the conveyor. The food products manufacturer came to us for a safety-conscious means of removing and transporting these lengthy and heavy pallets. 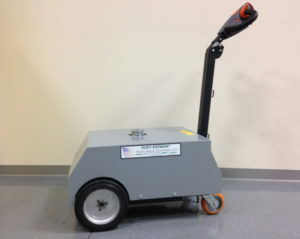 The solution Electro Kinetic Technologies provided was comprised of three main components: 10 custom non-motorized carts that would be used to stow and move the pallets once removed from the conveyor, a Pony Express 1065 tugger to move the pallets out of and into the production area on the non-motorized carts, and a custom tugger with powered lift to disengage the pallets from the conveyor. * Each piece of equipment is utilized in a systematized, strategic manner to maximize efficiency and safety in the production area. *See site analysis diagram below. You can also download the diagram here.